Hi there, Sherri Caramico here again! I hope you can join me for my next class at THE DOO to make this cool "Paradise" Mini! The album measures 6" x 6" and is filled with pockets, pull outs and 12 pages for you to add photos of your adventure in "Paradise" ~ wherever that may be! 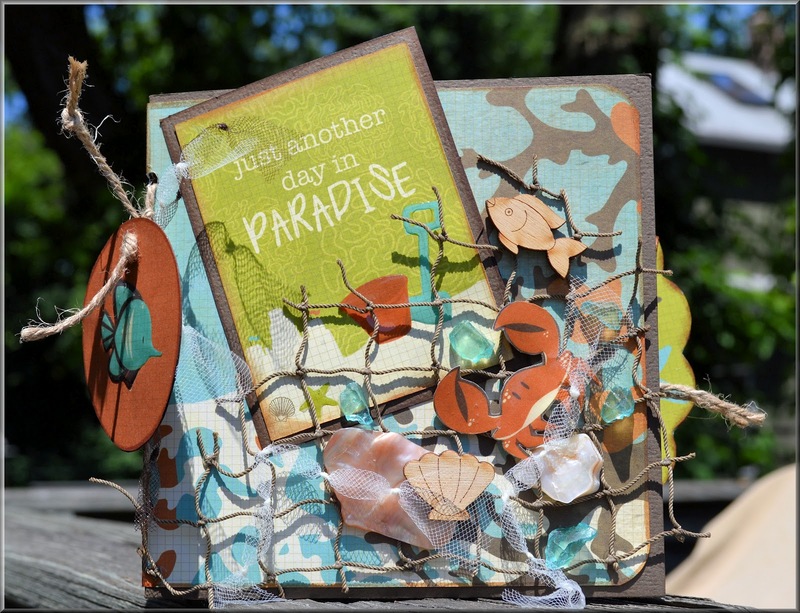 We will be using the NEW KAISERCRAFT "Rock Pool" collection - the colors are AMAZING - along with seashells, beach glass and fishing net! Techniques will include "fussy cutting," paper scoring, edge distressing with Ranger Distress Stain, pocket making, plus I will show you how you can make the most out of your paper by using your "scraps" in a unique way to embellish you book to the MAX!! * I will have the items marked with a ( * ) for you to share -or please bring or buy your own if you would like to work at your own pace. PLEASE CALL THE STORE TO RESERVE YOUR SEAT ASAP -THAT IS THE ONLY WAY TO INSURE YOU WILL HAVE A SEAT FOR THIS CLASS. - or on line orders - on or after June 23rd! (201)818-7060. HOPE TO SEE YOU THERE!